What's the Best Drying Rack for Homemade Soap? The best drying rack for homemade soap is air-ventilated, easily stored and easy to use. Racks are made of stainless steel, plastic coated metal, wood or heavy plastic. CAUTION! Never use a "regular" metal rack for drying homemade soap. When raw soap comes in contact with any kind of reactive metal, corrosion will occur. Your rack and homemade soap will be ruined. 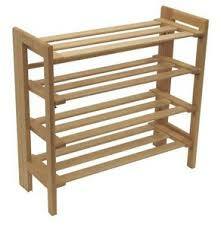 WOOD: These racks can be either be purchased ready-made or homemade to fit the space provided. Shelves are slatted for air-ventilation. Some racks have pull out drawers with small holes for air ventilation. Homemade racks are built to your specifications. PLASTIC COATED METAL: These racks are often used in closets, garages, offices or basements for easy storage and accessibility. These tiered shelf units can hold large amounts of soaps. Their found in many department stores, like Wal-Mart or Target. Find them online at Amazon. LARGE BREAD STORE TRAYS: These heavy plastic compact trays can stack on top of each other for easy storage. They're well ventilated, large in size with a square shape. They are not easy to find, though. Ask your local grocery or department store. STAINLESS STEEL: These racks have good air ventilation. They can be purchased at most department stores or online at Amazon. Use as a single rack or stack them for more storage. -- Each rack above is a good choice. One rack really isn't better than another. The drying speed of homemade soap will be the same for any rack. -- On any rack make sure you check your homemade soap. Turn your soaps every now and then, (maybe every week or so). Allow your homemade soap to receive good, all around, air-ventilation. Homemade soap takes approximately 4 weeks to completely cure. -- Learn how to make soap with proven homemade soap recipes! -- Use the best soap making equipment . Save time, money & energy!